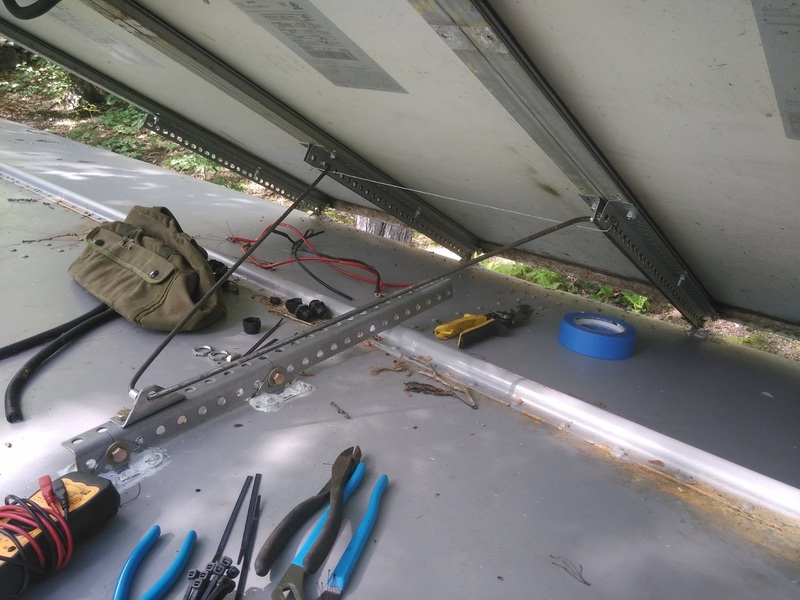 The past two days have been spent wiring the solar panels into the bus's electrical system. 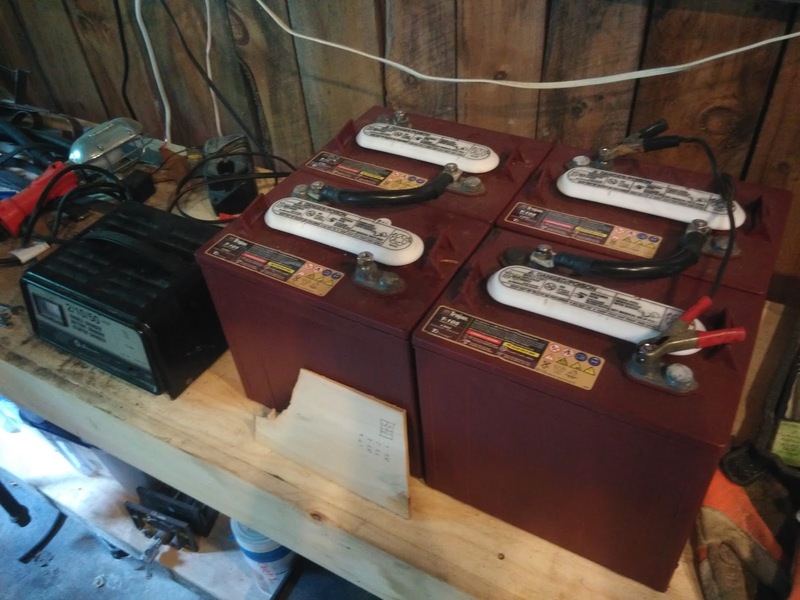 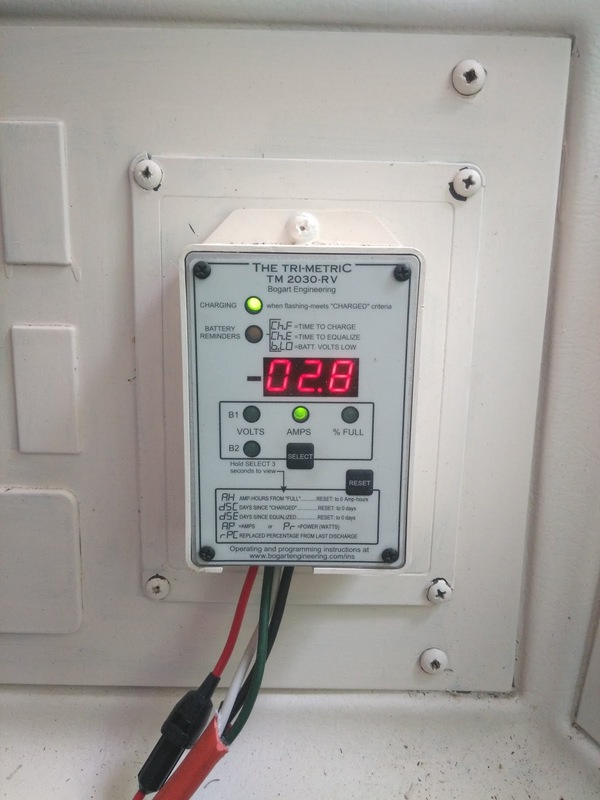 My primary references for this job were HandyBob's blog (this man is a wealth of knowledge; all the flakes of gold are buried in his entertaining rants about the solar industry,) and the manual for the TS-45 charge controller. 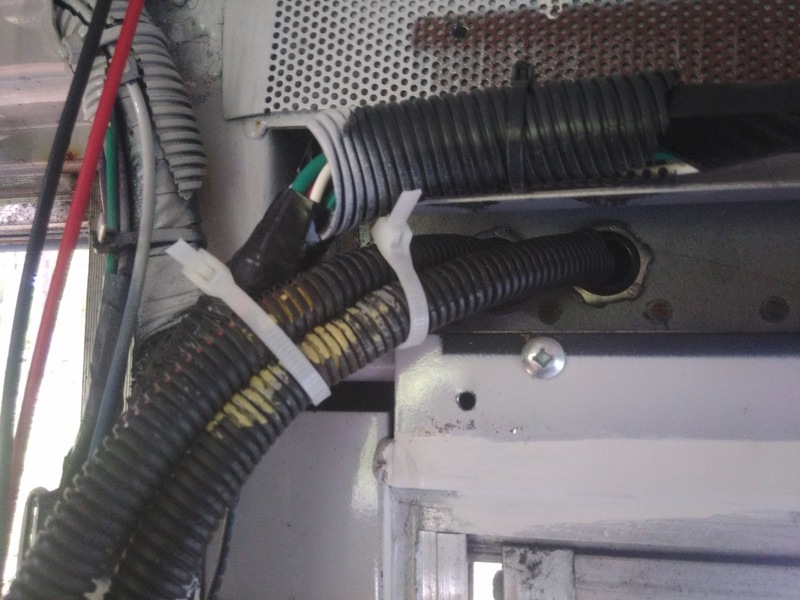 The quick fix to the solar panel struts bowing out was to lock-wire them across (I did not have 6-8 wraps per inch, because it's a bus.) 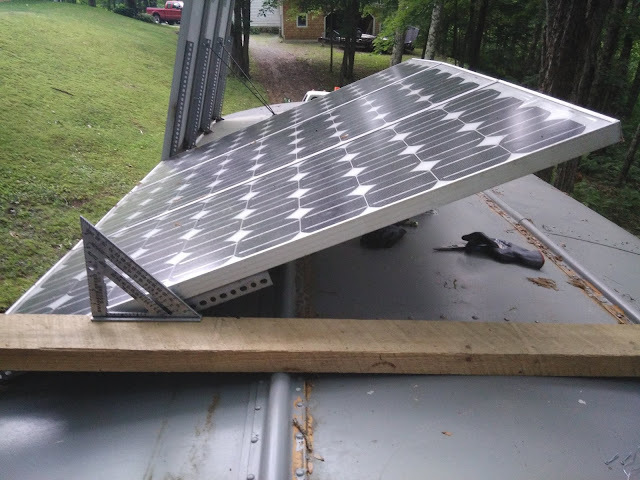 Now when the weight of the solar panels is on the struts, at the summer angles, the struts won't push through the angle mounts. It's not perfect, but it should work fine... until a wire snaps. With the panels mounted and mobile, I started wiring from the top down. I used 6 gauge cable to wire each array of 3 panels, down to the bus roof. The cable was clamped on the way to keep them from getting pinched, and slack was left on the roof to give me room to work later. 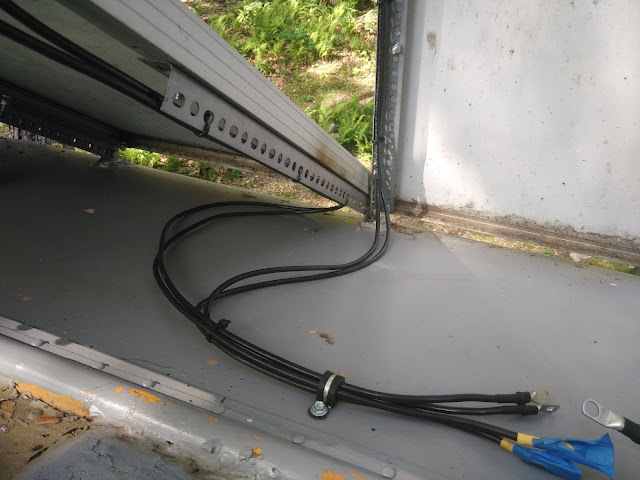 The two positive leads and two negative leads meet a positive and negative 4 gauge cable at the rooftop. 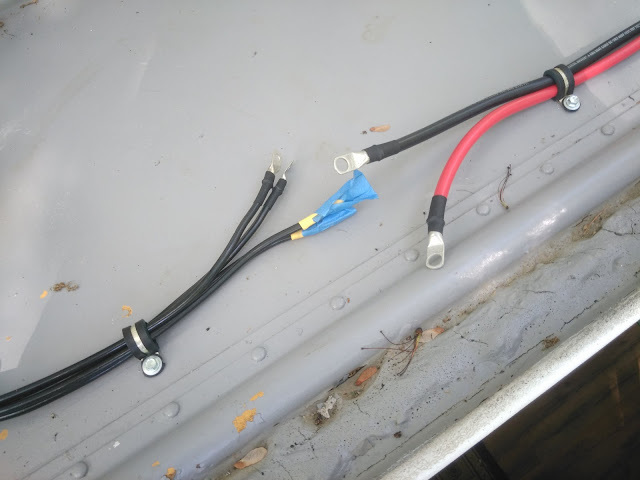 I have a fuse block on order, but in the short term I wired in a fuse to the hot leads, and taped the crap out of them to make sure everything works. 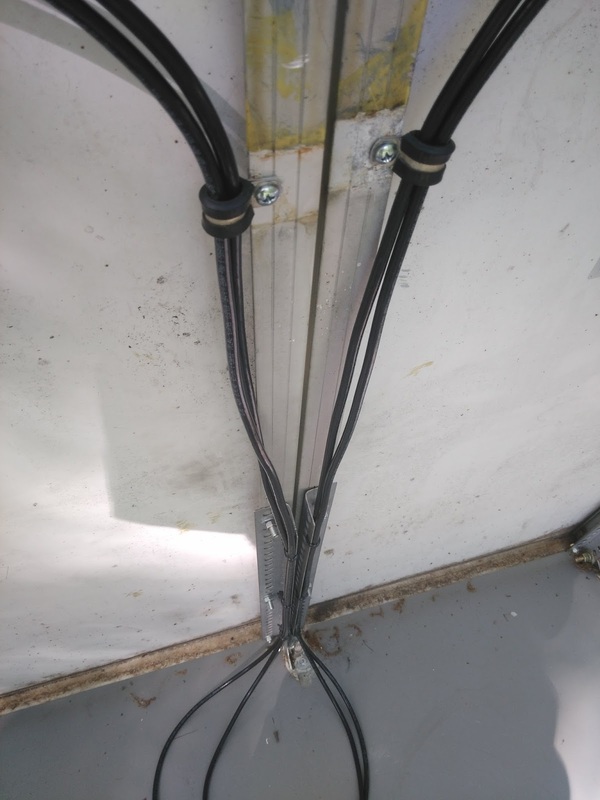 I had two of the cool little water-tight junctions left over from the panels, which the cable would fit through, but I didn't have a 13/16" holesaw. 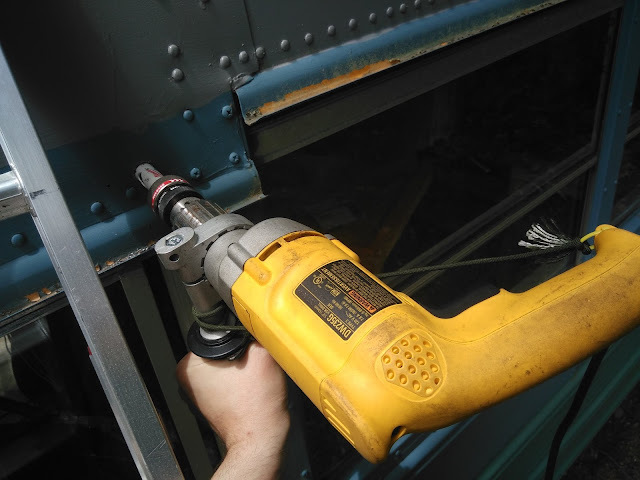 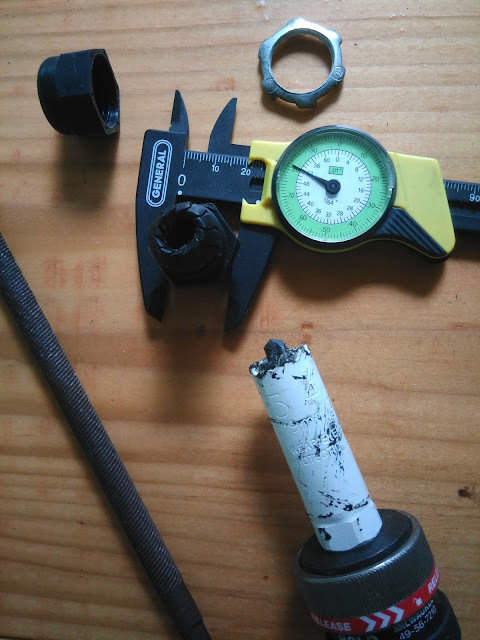 What I did have was a 3/4" holesaw and a round file. 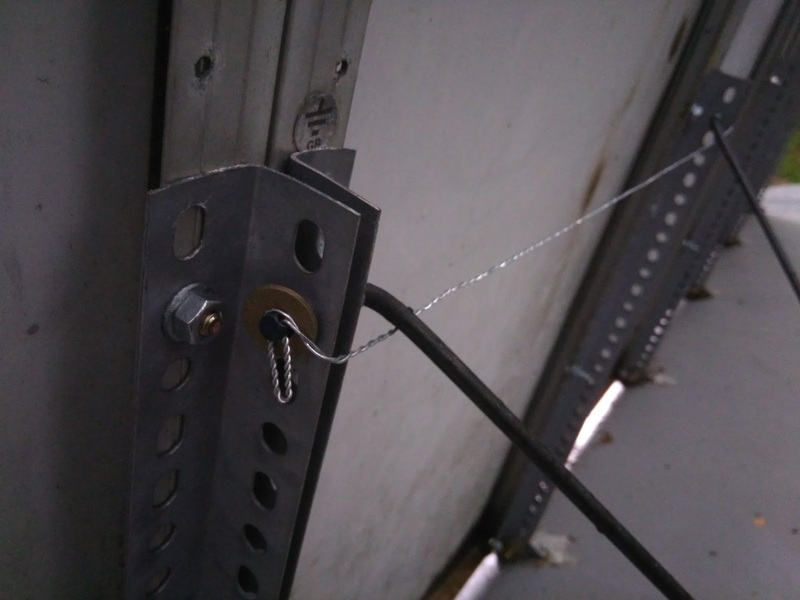 With the junctions installed, I pushed the cable through, and gave it a protective coating of spiral wrap. Inside the bus, I mounted the Tristar TS-45 charge controller on the front-face of the electrical panel for easy access. 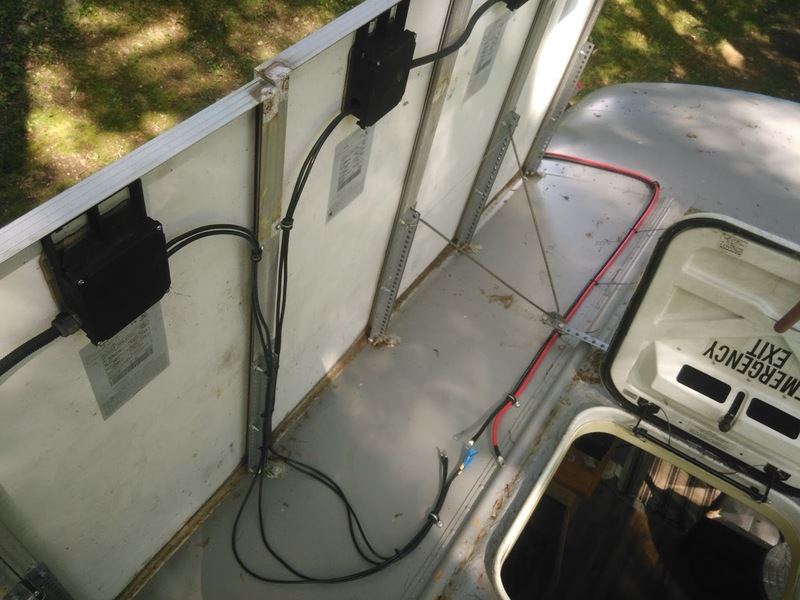 The two wires go under the panel, and mount into the negative shunt (so the Trimetric can monitor solar panel output) and the positive stud. 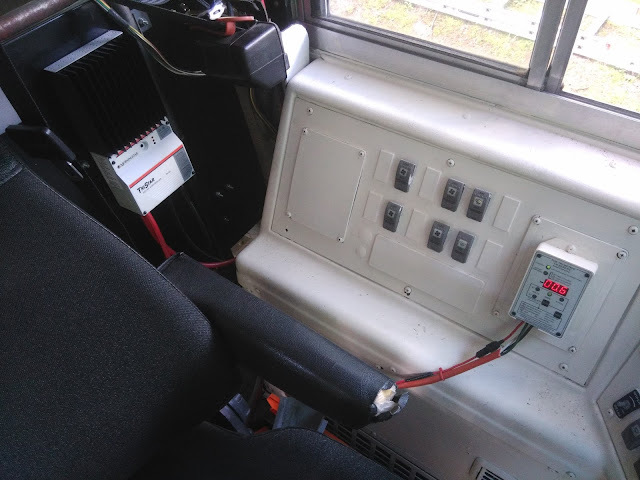 I routed the 4 gauge wires from the roof down the conduit behind the driver side window, and up into the charge controller. 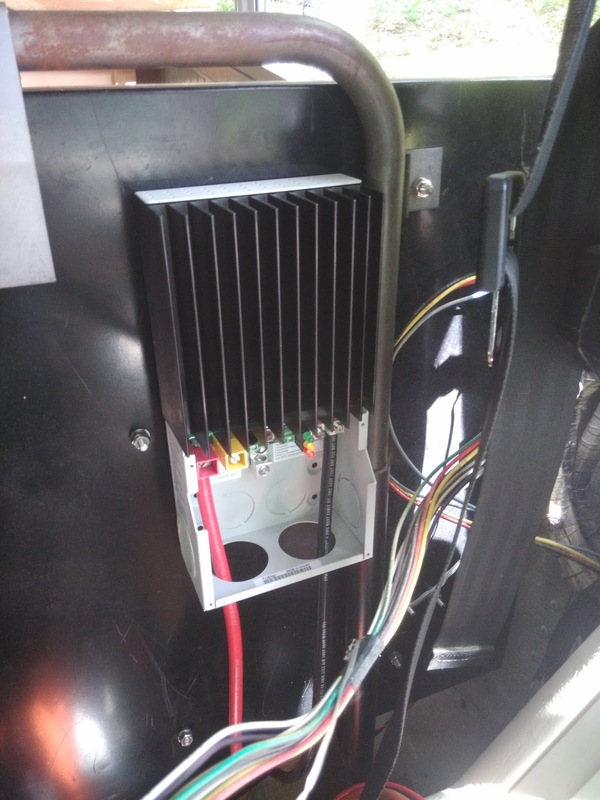 Face-plate back on. 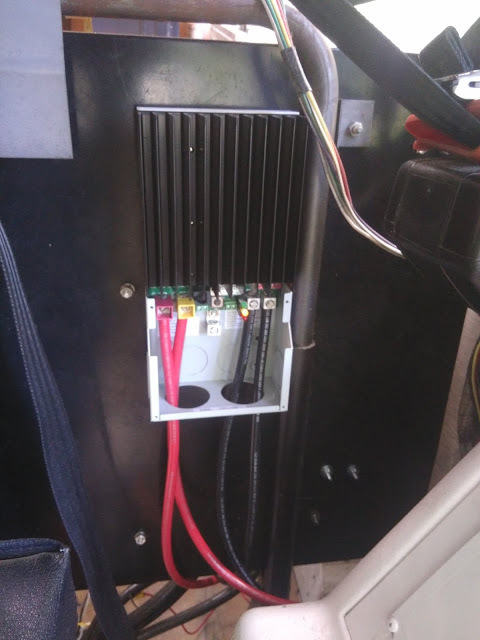 The TS-45 is pretty-much the Bus's Flux Capacitor. 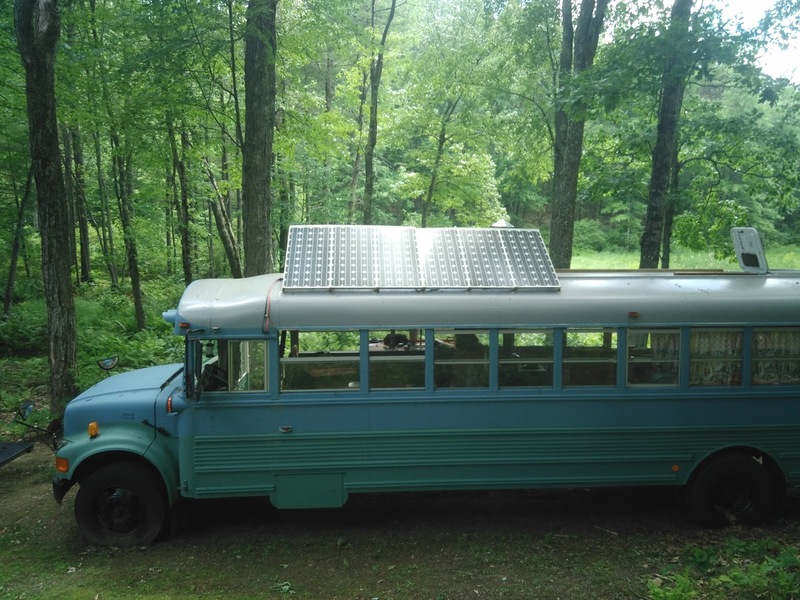 The bus now has wood or propane powered cook surfaces, wood or diesel heat, and diesel or solar electricity.